Chile has been the South American strongest Metal scene for many years, but even with that fact, we barely could hear some great names from the country in terms of bands, but there are some bands that are doing, for many years, fine works there. 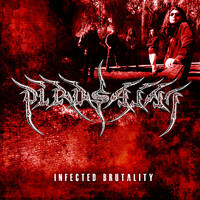 And PIROSAINT, now located in New York, is a good name, and now, they’re releasing a compilation of their Demos, the center of this review, “Infected Brutality”. Well, like all Demo collections, the music passed through a remastering process to gain some sound quality, but without altering what is recorded, and we can hear here a good band in their more Death Metal times, smelling to Swedish Death Metal scene, being DISMEMBER, CARNAGE and old ENTOMBED their greater musical inspirations, with grunt vocals, good guitar riffs (the solos are not so good as they could be), bass and drums doing heavy works with good technique. But don’t be exigent with them: have in mind that this work is a compilation of Demos. The tracks are raw and aggressive, but we can see that they have potential do a good work, especially on the Demos “Atrocity Noy Condign” (from 1992) and “Infected Dreams” (from 1994), but the live tracks shows a rawer sound, making our analysis more difficult, besides the potential of the band is clear. Good pieces we can hear in “Real Psychology” (good riffs and vocals), “Sent from the Emptiness” (played in mid tempos) and “Killed your Blood” (besides the guitars sound like an electric shaver), but the only good parts from the live tracks serve as a documentation, showing that the band is really good, but with a terrible sound quality. I hope that now, living in New York, PIROSAINT can do something more well worked the way that their music deserves.